EXUVIANCE Pigment Lifting Masque : What Does It REALLY Do? Hi there, my darlings! Today, let's talk about a skincare trend that's been pretty big in 2015 and which I've actually talked about on the blog a few times--sheet masks! These masks, although often a terror to look at, are usually packed full of skin-nourishing nutrients skin and very relaxing to boot. While you may think all sheet masks are the same, that couldn't be farther from the truth! These masks are infused with a specific set of skincare ingredients that are formulated for specific skintypes and issues. 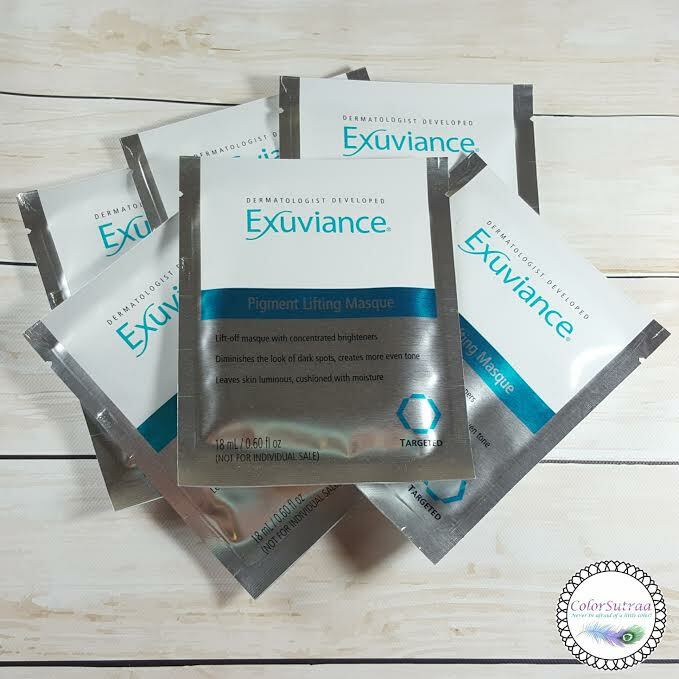 Today, let's talk about the benefits of Exuviance's Pigment Lifting Masque and what it did (and didn't do) for my skin! Specifically designed to adjust to fit any face, simply press the masque on your skin to adhere and lock in the active-rich formula, letting your skin absorb all the benefits of the brightening ingredients. Our patented NeoGlucosamine® gently exfoliates, helping to break up existing dark spots and creating more even pigment and youthful tone. Vitamin C takes the brightening process one step further, helping to diminish the look of existing dark spots and prevent the formation of new spots. The lightly hydrating serum leaves skin luminous and cushioned with moisture. Experience beautiful results when you lift off this special masque. Reveal a younger looking, brighter complexion with more even tone. How to use: Masques are single use. After cleansing, place the masque over the entire face, gently smoothing the fabric onto skin. Leave the masque on for 10 minutes allowing skin to absorb the potent brighteners. After 10 minutes, remove and discard the masque, massaging excess solution into the skin. Follow with a moisturizer. For best results, use with Exuviance® OptiLight products. IMPRESSIONS : I love sheet masks! They may make me look totally creepy, but who cares when it feels so good for my skin! I find these the quickest, easiest, and relatively least messy of all at-home spa treatments--apply, relax, discard! Easy as pie! And you don't even have to wash your face afterwards! Who doesn't have 10 minutes to lie back, close their eyes and do something good for their skin?! 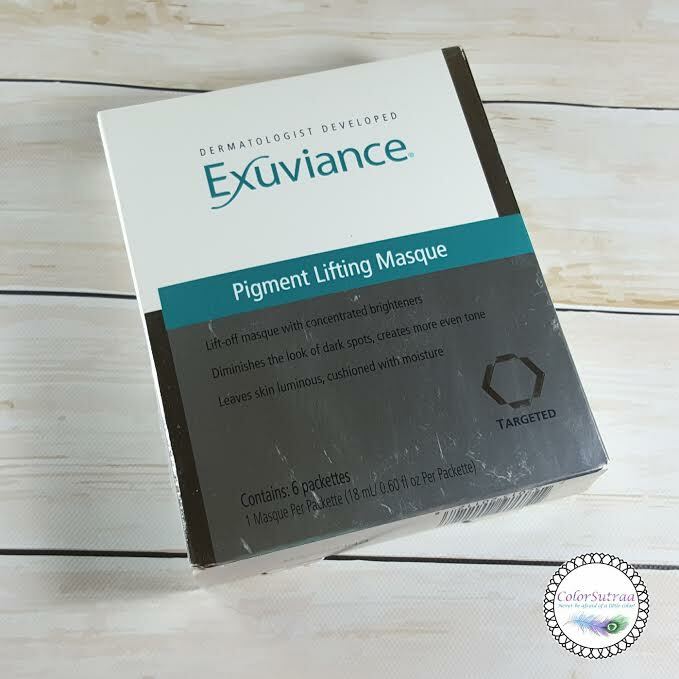 I love the fact that you can use this masque pretty much any season and it still will be great for your skin--sun damage doesn't happen only in the summer! If you're like me and heavy moisturizers bother you in the warmth of your heated homes in the winter, apply one of these sheet masks once a week and it'll take care of moisturizing your skin AND all that invisible sun damage. Now, let's talk about brightening. I have to admit, I used these masques a couple of times and, while my skin looked and felt better, it didn't do much for my pigmentation. Keep in mind that my dark spots are the result of acne scarring and not sun damage, which the masque does not claim to help so there's definitely that. 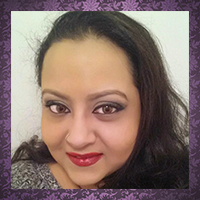 Overall, my skin DID look more even and more radiant, with a healthy, moisturized glow after each use. Worth the price tag? Most definitely!